[19:06] <+Caias> I’m Caias Ward, a designer located in New Jersey. I’ve written stuff for Aetherco (Continuum), Pinnacle (Path of Kane), SJGames (Pyramid Magazine) and Super Genius Games (Strike Force 7). I’m currently Kickstarting Trigger Happy, the RPG of Action, Crime and the World Which Hates You. [19:03] <+J_Arcana_Rising> I am John Berry, founder of Bedroom Wall Press, and author of the currently Kickstarting Arcana Rising. [19:04] <+J_Arcana_Rising> Arcana Rising is an urban fantasy roleplaying game that aims to marry old-school D&D with a modern setting, and is powered by the same system as the best-selling Hulks and Horrors. [19:12] <~Dan> Would anyone like to get us started with a question? [19:13] <~Dan> I’ll start us off, then! [19:13] <~Dan> Luke: The Amazing Race travels all over the world. How will the Quest mirror that? [19:14] <+Sean_Punch> What level of consulting have you done with people in the traditional pen-and-paper adventure games industry? [19:17] <~Dan> So is the show a bit more like, say, “Survivor,” except a fantasy location instead of an island? [19:19] <+Silverlion> Alas, I must run pick up my wife. [19:19] <~Dan> Do you know the sort of participant breakdown they’re looking for? For example, are you looking for one gamer, one Harry Potter guy, one horror fanatic, etc.? [19:23] <~Dan> Ah… as in people being themselves? [19:24] <~Dan> Are there any specific requirements regarding athletic ability? [19:25] <~Dan> And based upon my conversation with Jasmine, I gather that the balance of “brains vs. brawn” is still being worked out? [19:27] <~Dan> What’s your background with the fantasy genre, and was it part of what got you this particular job? [19:29] <~Dan> So, what were you working on prior to The Quest? [19:30] <+LukeQuestCasting> so I bounce all over the spectrum but I like to do feel good shows or action adventure. [19:30] <~Dan> Did the call go out for someone with some geek creds to handle casting for The Quest? Or did they know right off that you were their guy? [19:33] <~Dan> Ewwww. Yeah, I know exactly what you’re talking about. Heh. [19:34] <~Dan> So in both of your cases, this job was something you’d be doing anyway, but that just happens to be a chance to let you draw on your passions? [19:35] <~Dan> That’s a truly special opportunity. I envy you! [19:36] <~Dan> Do you know how long people would need to be available to film the show? [19:37] <~Dan> How hard is that for people to do, generally speaking? Do you find a lot of people who’d be ideal for a given show but who just can’t get away to do it? [19:39] <+LukeQuestCasting> heres the thing if you are passionate about something you will find a way to do it. [19:41] <~Dan> So as you’ve dived head-first into geek culture, has anything surprised you? For example, as long as I’ve been playing RPGs, I’m still forever surprised at just how Balkanized the hobby can be. [19:44] <+LukeQuestCasting> The biggest surprise to me is the day jobs. [19:44] <~Dan> Really? How so? [19:46] <~Dan> That’s a good point, actually. Geeks definitely come in all shapes and sizes. [19:47] <~Dan> Actually, that brings up another question: Do you have any concerns about people who don’t seem to be “legit” geeks? [19:48] <~Dan> I mean, I know from experience that you could have a show full of people that don’t fit the usual stereotypes. [19:48] <~Dan> Do you feel obligated to give people what they expect? [19:49] <+shockvalue> Just listening in. I actually auditioned in person in L.A. a few weeks ago with a friend. [19:50] <+shockvalue> Well, the first thing that comes to mind is: should I be worried if we haven’t been called back yet? [19:53] <+Sean_Punch> Heh, geeky can be a lot of things . . . Learning tango right now. The good dancers are geeky in a way most gamers could only hope to be. 🙂 And I’m a bigger geek about mixology than gaming, even though I earn a living at gaming. [19:55] <~Dan> Well, let me rephrase: Do you feel any need to make sure that at least some of the contestants look like what people think a nerd “really” looks like? [19:57] <+technoshaman> do you know if the show will be on netowrk or cable/satelite? [19:59] <+LukeQuestCasting> Shock Value where are you from? [20:04] <&Lolth> Well, from my point of view, it would be awesome if the balance of ratios between men and women is 1:1. [20:05] <~Dan> Any thoughts on the subject, Luke? [20:08] <~Dan> Would it be correct to say that in the auditions, it’s all about personality, given the fact that you don’t know what the contestants will be facing? [20:11] <&Lolth> Would you consider scouting people, say, from this channel or rpg.net’s forum? [20:12] <&Lolth> US specific or international? Speaking as, ahem, non-US citizen. [20:14] <~Dan> Do you try to find people who will make particularly good heroes and/or villains within the context of the show? [20:15] <~Dan> Ah! No problem, Luke. Thanks again for stopping by! [20:16] <~Dan> I’ll have the log posted shortly and will send Jasmine the link. [20:17] <~Dan> Do you have to run as well, Jasmine? [20:18] <~Dan> Okay! Have a great evening! [20:18] <~Dan> I’ll send you that log shortly. [19:02] <+PCIHenry> My name is Henry Lopez and I’m the owner of Paradigm Concepts, Inc. We produce a few different RPG games, such as Arcanis: The World of the Shattered empires, Rotted Capes – the Superhero Zombie game and Witch Hunter: The Invisible World a game of colonial swashbuckling horror set in a slightly alternate history from ours. [19:03] <+PCIHenry> We are holding a KickStarter to fund the second Edition and with only 3 days to go, we’re funded and hitting quite a few Stretch Goals. [19:02] <+JasonMHardy> Hi, I’m Jason Hardy, I’m the current Shadowrun line developer! 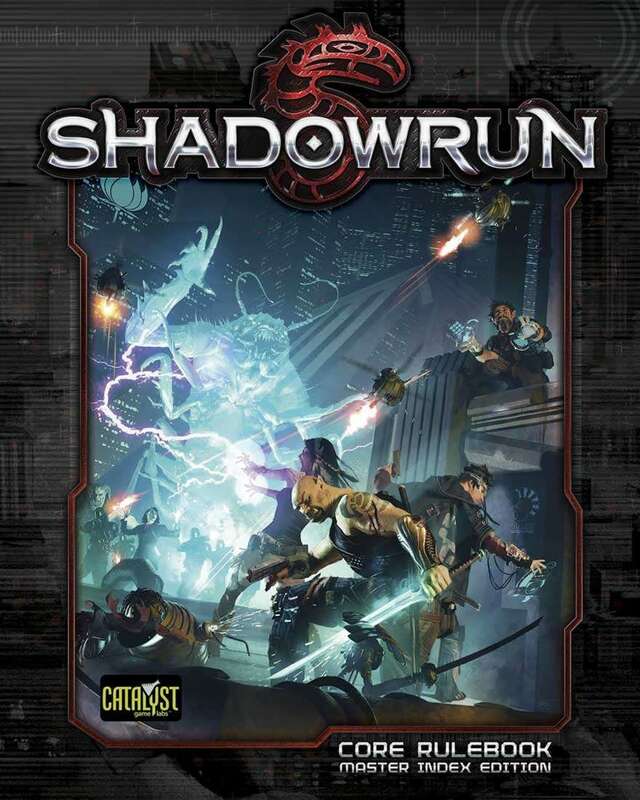 Shadowrun has been around for more than twenty years, and it’s a blend of cyberpunk and fantasy with a nice noir feel running throughout! [19:05] <+Sechin_Tower> My name is Sechin Tower and I’m the grand poobah of Siege Tower Games. I’m also the lead developer at Exile Game Studio where I’ve worked on Hollow Earth Expedition since the beginning and been the chief contributing writer for the supplements. Also, I’m author of Mad Science Institute, a novel of explosions and robots.